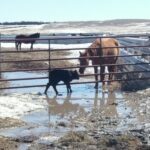 I wanted to share the reason I didn’t get to play with any horses today. 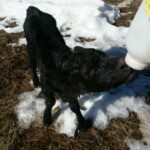 We were feeding this morning and my father in law said there was a calf that didn’t look great. I didn’t worry a whole lot. we are usually concerned about completely different things so I thought that if he was a little worried I probably wouldn’t be. After we got done feeding I finally was able to get out through the cows. The calf was laying there alone. Brand new but with no cow anywhere near. I got off to look at him and his mouth was cold. 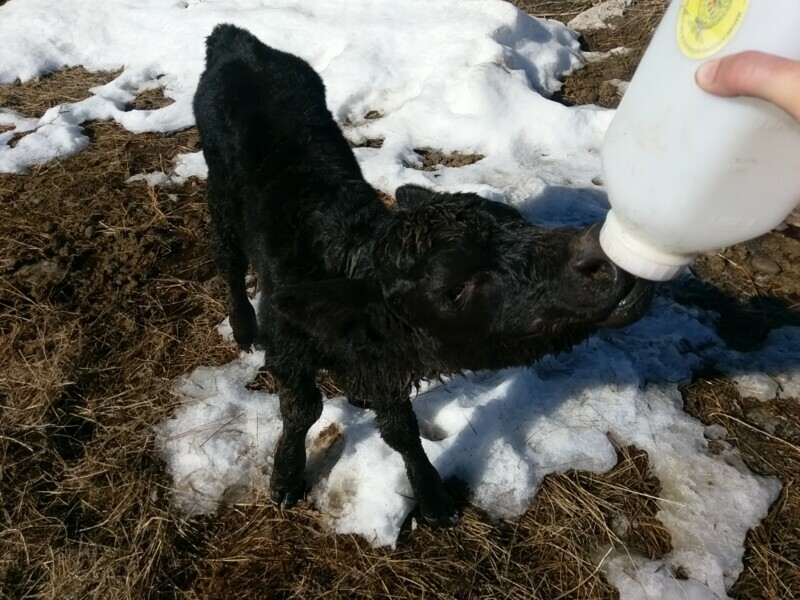 That’s the quick way to take calves temperatures. Like feeling a child’s forehead gives you an idea, sticking you finger in a calf’s mouth will tell you if they’re cold. He was freezing. I did a quick search for a cow who showed signs of recently giving birth. There was only one. I brought her over to the calf. She was not interested. 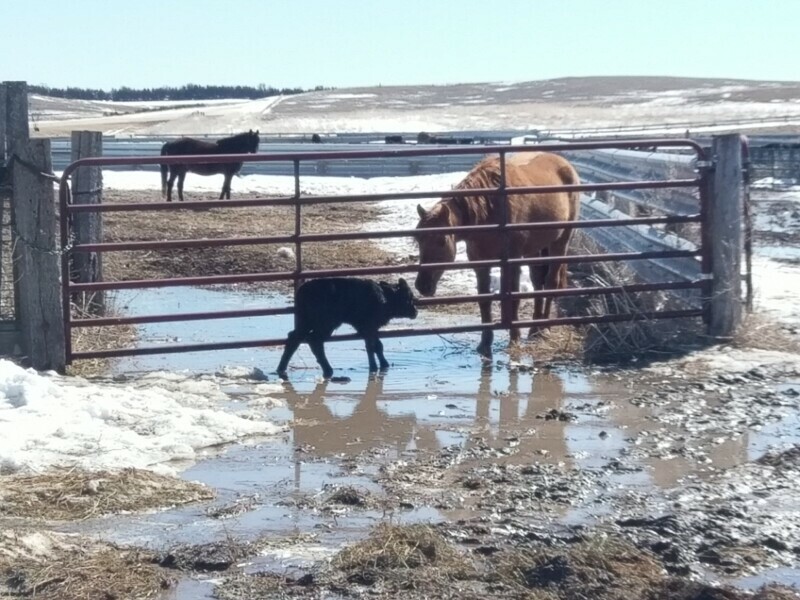 I put the calf on the back of the 4wheeler, they really are easier to get calves on than a horse 😉 and brought him out around the water to the barn. Of course I couldn’t get to the barn through snow drifts so we stopped at the corrals and I found a nice dry pile of hay to lay him on to soak up some sunshine while I got his mom. His mom was no more interested in leaving the corrals than she had been in her calf. I finally got her and a handful of other cows out and pushed them up the lane to the barn. Not all the way because there is a river and snow drifts. SO I parked the 4wheeler and walked them the rest of the way. The other cows sorted back easily and I left her in a small pen with her baby to walk the others back. Hoping that time in forced confinement would help her to remember she had a baby I went ahead and looked good through the rest of the herd to make sure there were no other problems. There weren’t. Of course he hadn’t nursed by the time I got back. Instead she was on the opposite side of the pen and he was shivering violently. I went to get colostrum. By the time I got that down him it was time to pick up children at school. His mom could get to him, if she would, and he was in a dry spot, much warmer than he had been. When I stuck my finger in his mouth it felt warm instead of cold. We hurried home hoping to find him following her around, afraid to find him dead. He was alive but still laying there. I left them for the time being to go check cows. There are a few, hopefully small, issues out in the corrals. One cow is wandering looking for her calf. I’ll give her time to look then go back and see if she found it. Done with that I got a bottle warmed for our calf. He took it enthusiastically and drained it too quickly. I put him back in a small pen with his mom in hopes that he will keep looking for something to finish filling his belly. And now any time I would have had to work a horse is gone. 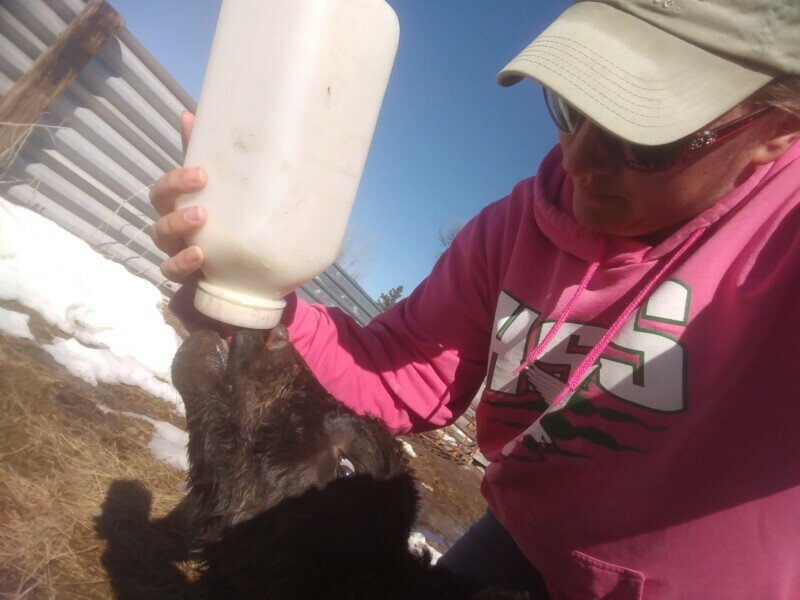 The general policy with calves is to try to get involved as little as possible. Usually we create more issues than we fix by interfering. 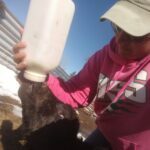 Cows will reject calves that we bottle feed or take away from them for any length of time. Things that are easier in the short run are harder long term. Letting the mom raise the calf is always better, and easier, than raising a bottle calf. If she hasn’t let him nurse by morning I’ll run her in the chute and make her hold still for him to nurse. If they both do this a couple fo times they might get it figured out on their own. Hopefully.